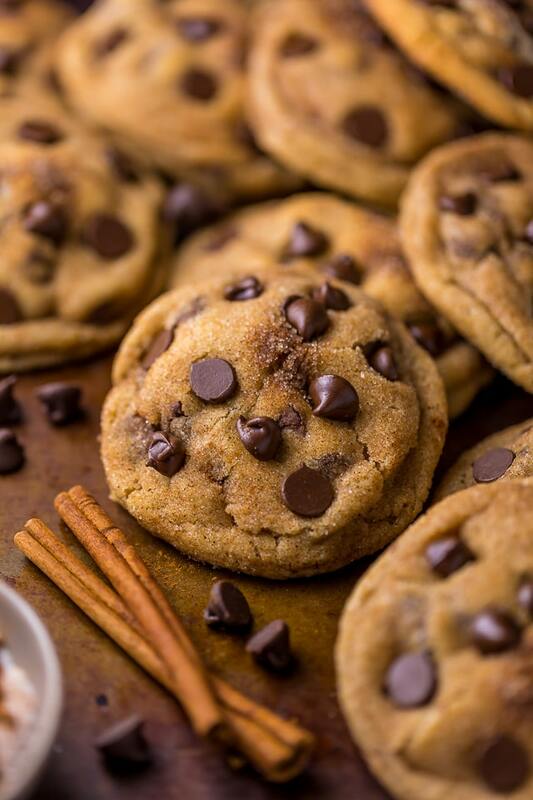 Thick and chewy, these Brown Butter Chocolate Chip Snickerdoodles are the ultimate holiday cookie! 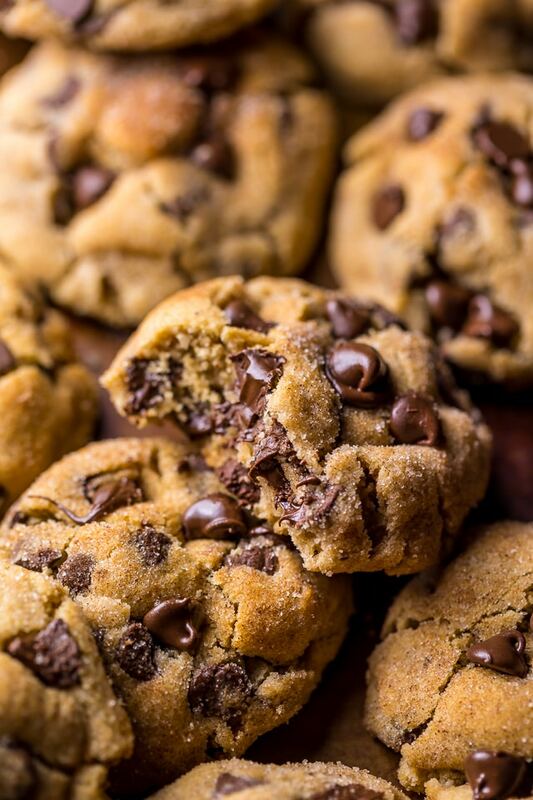 Today’s recipe for brown butter chocolate chip snickerdoodles requires all of those ingredients, plus cream of tartar, baking soda, salt, cinnamon, and chocolate chips! First of all, allow me to ask you a question: do you know how to brown butter? If you do, feel free to skip this lecture. But if you don’t, I’ve got you covered! Browning butter is insanely simple and I’m going to walk you through each step! To brown butter you’ll need a skillet or saute pan, butter, and a little patience. You’ll melt the butter as normal, then continue to cook it over medium heat – stirring occasionally – until it reaches a golden brown color. Watch your butter closely as it browns, because it can burn easily! Once it’s nice and golden brown, remove it from the heat and pour it into a heatproof bowl – being sure to scrape all of the golden bits off the bottom of the pan. And that’s it! Easy, right? Because the brown butter must come back to room temperature before using it in the cookie dough, you’ll want to plan ahead time wise. It will take about 2 hours. These cookies only need 9 to 10 minutes to bake, depending on your oven. So be sure you don’t over bake them! When you pull them from the oven they should be set at the edges, but still a little soft in the centers. The cookies will firm up as they cool. 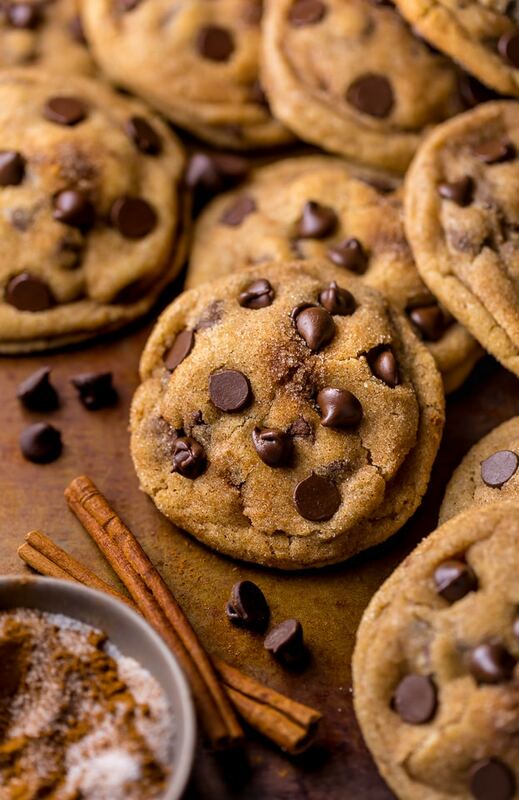 For extra chocolatey cookies, press a few chocolate chips on top as soon as they come out of the oven. While these cookies are delicious on their own, they’re extra enjoyable with a warm Winter beverage like cocoa, coffee, or chai tea! You know… for dunking 😉 Enjoy! And I’ll see you tomorrow with a brand new breakfast recipe! (Hint: PANCAKES). In a small bowl, combine the granulated sugar and cinnamon; set aside until needed. Cut the butter in tablespoons and place them in a heavy saucepan over medium heat. Once the butter has melted, reduce the heat to low and continue cooking, until the solids sink to the bottom of the pan and turn golden brown, about 10 minutes. Remove from heat, pour browned butter into a small bowl, cover, and refrigerate until solidified, about 2 hours. Preheat oven to 375°F (129°C). Line two large baking sheets with parchment paper and set them aside. In the bowl of a stand mixer fitted with the paddle attachment, or in a large bowl using a hand-held electric mixer, beat the butter on medium speed until completely smooth, about 1 minute. Add in both sugars and continue beating until light and fluffy, about 2 minutes. Add in the egg, egg yolk, and vanilla and beat smooth, scraping down the sides as needed. In a medium mixing bowl, whisk together the flour, cornstarch, cream of tartar, baking soda, cinnamon, and salt. With the mixer on low speed, gradually add the dry ingredients to the wet ingredients, mixing just until the dry ingredients are incorporated. Beat in the chocolate chips. Be sure not to over mix the dough! Using an ice cream scoop, melon baller, or measuring spoon, scoop out one and a half sized tablespoons of dough from the bowl and roll it into a ball. Roll the dough in the cinnamon sugar topping, then transfer the ball onto a prepared baking sheet. Repeat with all cookie dough. Bake cookies, one tray at a time, for 9-10 minutes, or until they're set at the edges but still soft in the center. 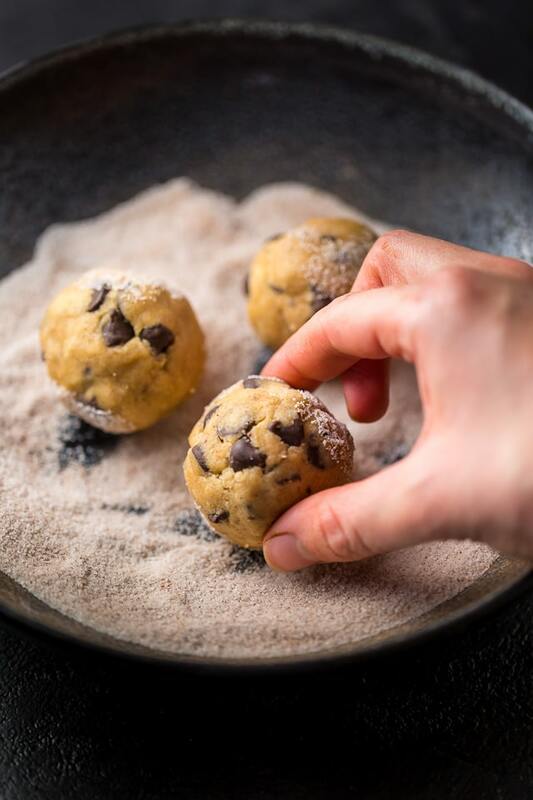 Allow cookies to cool on the baking sheet placed on top of a wire rack for 10 minutes before serving warm, or transferring to a wire rack to cool completely. Do you use mini chocolate chips? No, I used regular sized chocolate chips, but mini ones would work! Thank you! Baking these this weekend! Can I omit the choc chips altogether? What’s the purpose of the cream of tarter? How well do your recipes work at high altitude? Do they need adjusting? Hi Carma. I honestly have no idea. All of my recipes are baked in Philadelphia, so altitude is never an issue. The dough seems very crumbly – here’s to hoping they turn out! The ingredient list includes corn starch, but I don’t see it in the preparation instructions. Did I miss something? Can you freeze the cookie dough? 375F to deg is 129deg?